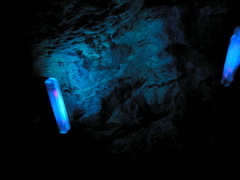 When some substances are exposed to invisible ultraviolet light they emit visible light. 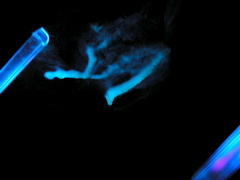 This phenomenon is called fluorescence. The ultraviolet light interacts with the electrons in the atoms of a fluorescent substance, and some of the electrons move briefly to higher energy orbits and then quickly drop back to their original orbits. In dropping back, an electron loses energy and gives off visible light. 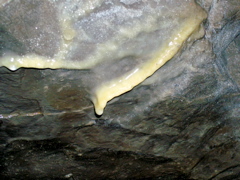 The photos below were taken in a mine near Akron, New York. 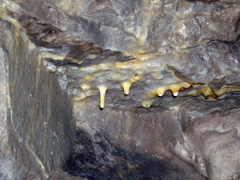 The formations are made of calcium carbonate (calcite). The photos on the left were talen by white or visible light generated by the flash unit of my camera. 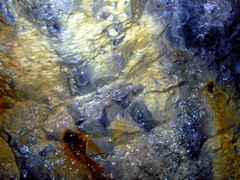 The photos on the right were talen by using two longwave ultraviolet lights to illuminate the area. This type of light is commonly known as "blacklight" and is widely used in entertainment and advertising. I used a digital camera and an exposure time of four seconds. 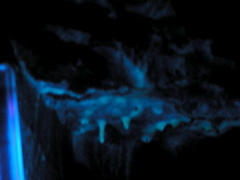 When the ultraviolet lights were turned off, a brief (two to three seconds) greenish-white phosphorescence of the formations was noticed. The phosphorescence is caused by the energized electrons slowly returning to their normal orbits.